Sixteen pilot whales, including four calves, were injured by an undersea earthquake on 11 August 2012. They died in a mass stranding on the coast of Fife in Scotland. The pod of 26 was discovered inside a cove on a small sandy beach at the base of steep cliffs in Pittenweem, near St Andrews, shortly after 7am on Sunday (02 Sept 2012). A further 24 pilot whales from the same pod have been seen in the shallows three miles along the coast at Cellardyke. They were being closely observed amid fears they might also beach. 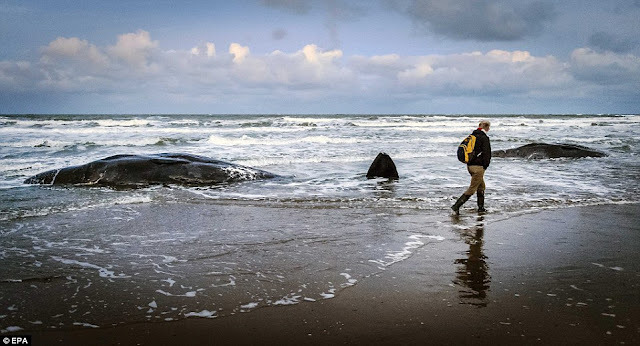 A spokesman for Fife coast guard said: "The usual scenario would be that the whale that is leading the group has become ill, or has lost its way, and gets beached and the rest will follow on, although we do not know for sure if that is what happened." This NONSENSE is wrong. To understand why I say this read "Whale Stranding Conspiracy." The truth is that all the whales in the pod are lost and swimming along with the flow of the surface currents. The quake was focused only 3 km below the ocean's surface at an intersection of an east-west trending transform fault and a small section of the north-south running mid-ocean ridge axis. An extremely shallow seafloor quake is especially dangerous because when the focal distance below the seafloor is less the the length of the average P-wave in the solid bottom, the low frequency pressure changes pass through the rock/water interface as if there was not interface at all. The average length of the average low frequency P-wave is 7 km. With a depth of focus only 3km below the seabed, the low frequency noise would be strong enough to not only destroy their cranial air spaces but would also cause cochlea damage. In this message sent on 16 August to all members of the European Cetacean Society, I warned that the above whale-dangerous earthquake had occurred. They knew about my work and understood that I was saying this quake could cause a beaching. The Northern Mid-Atlantic Ridge, where these quakes occurred, is a prime feeding ground for pilot whales diving to ~1,000 meters to feed on schools of squid. Seaquake waves (aka; potent disturbances in water pressure) generated by shallow quakes induced barosinusitis in the sinuses and air sacs of all adult members of the diving pod. The injury disables each whale's ability to echo-navigate and to dive and feed itself. The pod becomes lost at sea! Because water in 700 times more dense than air, resistance (drag) to swimming in any direction except with the flow, quickly turns the lost pod and points their streamlined bodies headfirst in a downstream direction. Said differently, surface currents control their travel path from the point of injury to the beach, not the lost whales. Thus... understanding the physical characteristics of the surface currents around Scotland is fundamental to understanding why these whales landed where they did. Here are some websites that will give you a complete picture and cause you to understand why whales accidently swim into the sand. Remember, surface currents control the swim path of the seaquake-injured whales... the whales themselves have very little to say about where they are washed ashore. The quake was located at 52:21N; 31:46W, which is situated in the lower left-hand corner of the surface current chart below. You can see that the surface flow was east for ~500 hundred miles and then shifted north around Iceland and toward Scotland. As you can see in this chart below, there is a shoreward current (green) that hugs the East Coast. The chart below verifies this fact. The injured pod swam about 100 miles per day downstream and were eventually washed into the cove and onto the sand at the base of the steep cliffs in Pittenweem, 1,500 hundred miles from the quake's epicenter. The pod came in on the surface flow created by a rising tide and a shoreward wind as you can see in thisvideo. This pod likely stranded at night when the winds and seas were a bit more rough. The darkness, the breaking waves, and the sand and bubbles entrapped in the water prevented them from spotting the beach. Knowing that half-starved sharks were trailing behind them also pressed them forward. 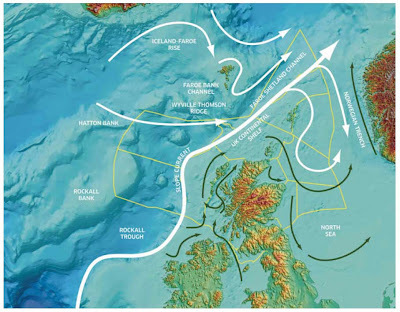 When the high tide refloated the whales and then began to ebb, the inward flow of the surface current changed and began slowly flowing offshore. This is when the rescuers decided to release the whales in hopes the flow of the outgoing tide would wash them back out to sea. As you can clearly see in this rather long video, the whales had no sense of direction whatsoever. They had no idea how to get to deep water or where they were going just as they had no idea where they were when they went ashore. The fear of shark attack causes the pod to remain close to each other; this is simply the herding instinct observed is so many land animals and in schools of fish. They are no strong social bonds; there is only fear of being eaten alive. This fear causes the near panic you see in the one whale that swam off on his own in the above video. The "follow the leader theory" is simply a figment of the observer's imagination. The self-preservation of the individual is what matters when one lost whale follows another to the beach. The one following hopes the one in front knows where he is going so he follows. It is a perfect example of the acoustically blind leading the acoustically blind. An investigation into the local weather conditions will reveal shoreward wind and a rising tide favorable for washing this lost pod toward the sandy area at this particular location along the coast. It's all in the timing of the surface flow and the falling tide favorable to guide them back out to the waiting sharks. The pod passed the area at the time when the winds, helped by the incoming tide, blew them ashore. UPDATE: On Tuesday the released whales were spotted milling around near the Forth bridges. North Queensferry residents David Skivens and Mick Schofield took Mick's inflatable dinghy out on the Forth on Monday evening and attempted to guide the whales out and prevent them from beaching. David said, "They seemed very confused and seemed to be going out to sea but within seconds they were turning back again." It won't be long until the sharks take them, as has been Nature's way for millions of years. The well-meaning rescuers were not saving whales; but, at least, they were doing good by feeding the starving sharks. UPDATE (Sept 8): The pilot whales are still alive and still lost at sea. The rescuers "hope" they are feeding and will soon move far offshore and out of sight so they can claim another false success. There are ways to save stranded whales but it will require herding them into a cove, protecting them from shark attack, and figuring out a way to provide lost of fresh water and feed them for a few weeks. Anonymous... Thanks for the heads up. This is one of the most whale-dangerous earthquakes I've ever seen in a known odontoceti feeding ground. I even think there are some baleen whales in the area that might have been injured. There are only two questions in my mind. One is whether or not the event gave off any precursors in time for the whales to scamper away. The second question concerns the motion in the seafloor. This quake was centered in a transform fault and was not thrusting--the motion was mostly side to side. However, it would still have generated some powerful pressure oscillation in the horizontal plane coming off the sides of any high mountains. I doubt the precursors. My gut says this event will send a pod or two to the beach or to the bottom. My problem is that I cannot get a good feel for the surface currents in the area. My data services shuts down at 60N. I need to find time to work on getting better SST data. The way I see it now, any injured whales will move south, but might head toward Scotland, Ireland, Iceland, and maybe around the tip of Greenland to Newfoundland and even as far south as Cape Cod. They could also turn south along the eastern shores of Iceland and head straight for the Faroe Islands and end up being driven ashore in the drive fishery. 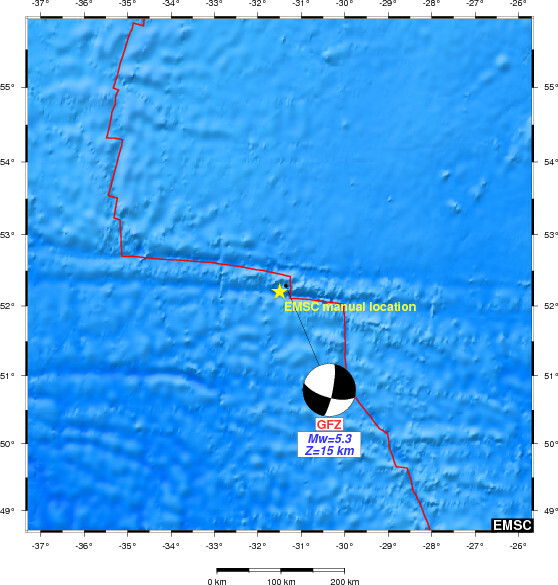 The European Seismological site shows that this event was only 2 km below the ocean's surface. This means that much of the energy at the very heart of this event entered the water column. The USGS defaults depth at 10 km. Another large number was the 651 stations reporting around the world. This was truly a monster ridge system event. hi david, thanks for your comments on the Jan Mayen quake. Here is a further quake you may be interested in if you haven't seen it. Anon... The European group has better grip on quakes in the high country north of Iceland. They show this event as thrusting and only 2 km below the ocean surface. This is certain a whale-dangerous event. The saving factor is that it occurred at ~2 PM in afternoon--a period when the whales are usually taking a nap on the surface. If this was the case, they would simply raise the heads out of the water (spy hopping) and escape serious injury. I have tied quakes in this are to several beluga strandings 5-6 years ago. The only problem is that the currents here wash south along the eastern shores of Greenland. There are a few native groups hunting beluga in this area who will spear any whales they see milling around the coastline. Thus, an actual beaching looks doubtful. On a scale from 1 to 10, I give this one a 3. I must be following 10+ earthquakes with the potential to cause a beaching before the month is up. We already have 3 mass strandings and might get 3-4 more in September. I do not recall a September when there was so many quakes with potential to cause beachings. I hope not; but this could be a really bad month for the whales. 4 mass strandings. One in Cape Verde on August 24th, 2012 along with pittenweem, cape cod and florida. sorry, see you meant strandings in september. 4 in 2 weeks up and down the atlantic and north sea is a lot though yes? I've only recently found your website. It is very interesting. Have you looked into the possibilities of varying degrees of barotrauma in whales from precursory acoustic emissions? I have read a few studies on precursory acoustic emissions yet, am unsure whether these are powerful enough to cause trauma and/or cause strandings. Some circles on the web suggest strandings are not only causal of quakes but, also may precede them as a result of either fleeing from the danger of a coming quake and/or trauma from the precursory emissions. Just wondered if you have any thoughts on that? It was great chatting with you today. I was in Moray Firth near Aberdeen 2 years ago filming the Cetacean Research and Rescue Unit. We spent quite of time on a small zodiac in the Firth studying dolphins and minke whale behaviour. It was evident that there were significant currents in that area.